‘Halos wala na ngang suporta na nakukuha ang mga lumad community schools mula sa pamahalaan, kinakampuhan at inaatake pa sila ng mga militar,’ (Lumad community schools have almost recieved nothing from the government; yet, they have been subjected to encampment and military attacks) this was the sentiment aired by members of Save our Schools Network in a protest action led by GABRIELA during the congressional deliberation on the proposed P436 B DepEd budget for 2016 in the House of Representatives earlier today. According to Save Our Schools spokesperson Reina Requioma, glaring cases of military attacks on lumad community schools have been documented in recent years. However, despite series of dialogues with the education department regarding the issue, the cases have only increased with impunity. Requioma said that Sec. Armin Luistro is likewise liable. DepEd memorandum 221, s.2013 or the Guidelines on the Protection of Children During Armed Conflict has permitted the military elements to use schools during their operations. Luistro has not rescinded the memorandum despite numerous protests from lumad community schools. ‘He had failed to provide special protection for lumad community schools and other alternative learning institutions, rather, he conspied with the AFP in turning these schools into unsafe grounds,’ she said. Last September 1, Emerito ‘Tatay Emok’ Samarca, executive director of Alternative Learning Center for Agriculture and Livelihood Development (ALCADEV), Malahutayong Pakigbisog Alang sa Sumusunod (MAPASU) chair Dionel Campos and Datu Jovillo Sinzo were killed by elemens of paramilitary group Magahat/Bagani forces under the auspices of the 36th Infantry Battalion. Samarca was found dead in one of the classrooms of ALCADEV at Sitio Han-Ayan, Diatagon, Lianga, Surigao del Sur. ‘Tatay Emok was among the countless individuals who have unselfishly devoted their life in giving educational services to indigenous communities, a responsibility that should be first and foremest the education department’s duty. His unfortunate death could have been prevented had DepEd performed its duty in ensuring protection for lumad schools,’ she continued. 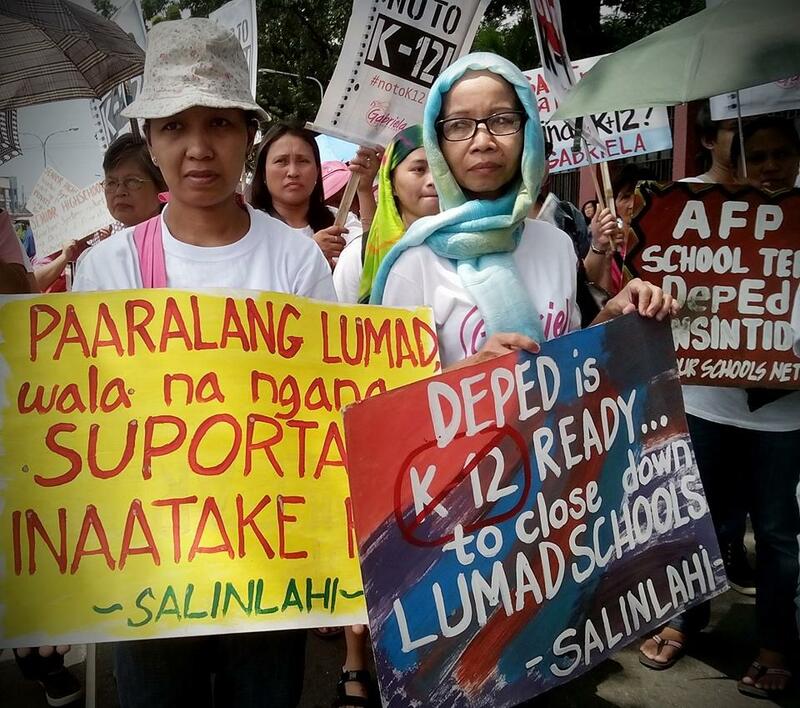 She also recounted that DepEd Davao del Norte Division had attempted to close down lumad schools and requested the installation of public schools which will have military personnel as para-teachers during the opening of classes this school year. ‘We cannot allow the education department to use our taxpayers’ money to sponsor their collusion with the military in attacking the efforts of indigenous communities to provide education for their children,’ she stressed. ‘Kung sa iba’t-ibang bahagi ng bansa, unti-unting pinapatay ng programang K-12 ang mga estudyante’t magulang dahil sa sobrang haba, hirap at laki ng gastusin sa pag-aaral. Sa mga kabundukan naman sa Mindanao ay literal silang pinapatay ng mga bala ng mga sundalong pinahintulutan ng DepEd na gawing kampo ang kanilang mga eskwelahan,’ lamented Kharlo Manano, Salinlahi secretary-general. 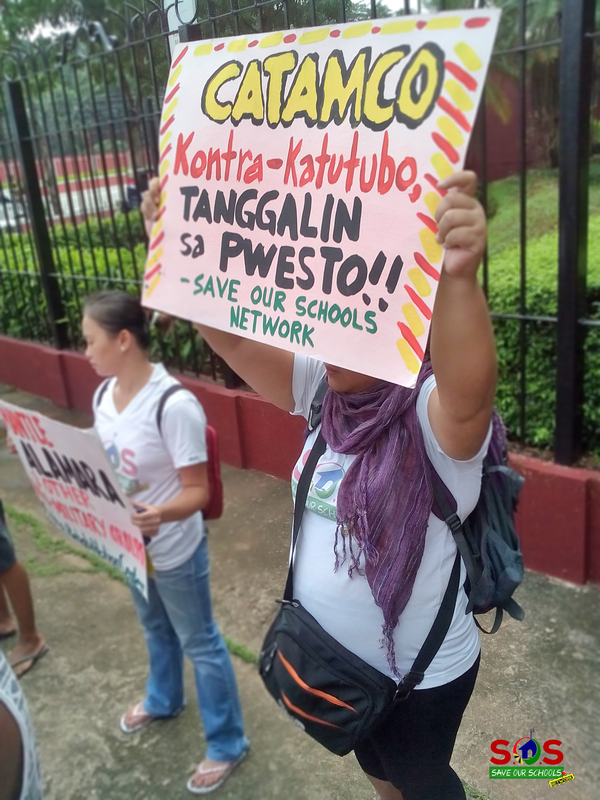 Students and teachers from Lumad community schools in Mindanao together with different organizations under the banner of Save Our Schools Network expressed disappointment over the failure of Department of Education (DepEd) Secretary Bro. Armin Luisto to appear in the dialogue earlier today. “For the fourth time, Sec. Luistro showed his cold-heartedness over the plight of lumad students and teachers whose rights were violated due to military operations. Lumad students and teachers from Mindanao have determinedly travelled to Manila to voice out the cases of military encampment and attacks on their schools including the harassment of students and teachers. However, DepEd, again, remain futile in giving concrete resolutions,” said SOS Network Spokesperson Madella Santiago. The group also slammed the DepEd over the issuance of Memorandum 221, series of 2013 that further allows the use of schools for military purposes. In response, DepEd Assistant Secretary Umali, who appeared in the dialogue, promised to review the said memorandum. “We are not satisfied with the result of the dialogue, what Sec. Luistro’s subordinates have promised are the things we have already heard in our previous engagements with them. It is Luistro’s executive power as department secretary to revoke DepEd memo 221 that we seek, not empty promises,” Santiago lamented.